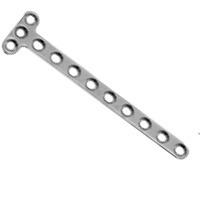 These orthopedic screws and plates are designed for metacarpal, metatarsal and foot surgeries. 1.5 mm Cortex Screws - Used to fix fracture fragments in the phalanges, metacarpals and small bones in the foot. These screws may be used independently as lag screws, or they may be used through a plate. 2.0 mm Cortex Screws - Used to fix fracture fragments in the proximal and middle phalanges and metacarpals or for foot surgery. 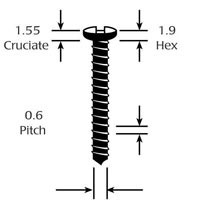 2.7 mm Cortex Screws - Used in the metacarpal and metatarsal bones and also in certain indications in the radius and ulna. Mini Plates - A variety of plates are available for use with the cortex screws. Here are the Orthopedic 2.0 mm Cortex Screws for veterinary surgery (hex and cruciated).